This is Steve Villa with Superior Sandbag Systems, the guys with the continuous sandbag system that you were so kind to include in your blog some time ago. Thanks for that. I wanted to get some information out regarding 14″ & 18″ wide woven tubular fabric that we have in supply and want to sell. For our purposes, erosion and flood control, we have upgraded the bag material we use with our machine to a heavy duty, military spec material. To make room, I have about 85 rolls of each 14″ and 18″ tubular bag material (170 rolls total) that we want to offer at a considerable savings to the public. The fabric is an 850 denier, 10×10 construction, 2000hr UVI material, white in color. The rolls are 6000/lf long and I will offer them for the $0.12 & $0.15 per foot, FOB Santa Ana, Ca. until they are all gone. They are sold by the roll only. Minimum of 1 roll. They have our company name printed on every 42″ on the material. This is excellent material that is uv stabilized and perfect for earthbag structures. Do you still have surplus tubular rolls ? Do you have any rolls left? You might call Steve at 949-338-5978 to find out. Do you still have surplus bags. I see this was put out in 2010. Also, how long is one roll? How much to ship to NW Montana? We don’t sell bags. No idea how long rolls are (probably varies). You’ll have to contact them. 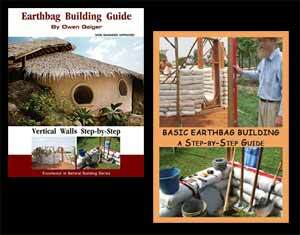 Most every earthbag structure needs 18″ wide tubes or bags, measured flat when empty.